Nitrate (NO3−N) export from row crop agricultural systems with subsurface tile drainage continues to be a major water quality concern. Woodchip bioreactors are an effective edge-of-field practice designed to remove NO3−N from tile drainage. The NO3−N removal rate of woodchip bioreactors can be impacted by several factors, including hydraulic residence time(HRT). This study examined the impact of three HRTs, 2 h, 8 h, and 16 h, on NO3−N removal in a set of nine pilot-scale woodchip bioreactors in Central Iowa. NO3−N concentration reduction from the inlet to the outlet was significantly different for all HRTs (p < 0.05). The 16 h HRT removed the most NO3−N by concentration (7.5 mg L−1) and had the highest removal efficiency at 53.8%. The 8 h HRT removed an average of 5.5 mg L−1 NO3−N with a removal efficiency of 32.1%. The 2 h HRT removed an average of 1.3 mg L−1 NO3−N with a removal efficiency of 9.0%. The 2 h HRT had the highest NO3−N mass removal rate (MRR) at 9.0 g m−3 day−1, followed by the 8 h HRT at 8.5 g m−3 day−1, and the 16 h HRT at 7.4 g m−3 day−1, all of which were statistically different (p < 0.05). Significant explanatory variables for removal efficiency were HRT (p < 0.001) and influent NO3−N concentration (p < 0.001), (R2 = 0.80), with HRT accounting for 93% contribution. When paired with results from a companion study, the ideal HRT for the bioreactors was 8 h to achieve maximum NO3−N removal while reducing the impact from greenhouse gas emissions. This article is published as Martin, E. A., M. P. Davis, T. B. Moorman, T. M. Isenhart, and M. L. Soupir. 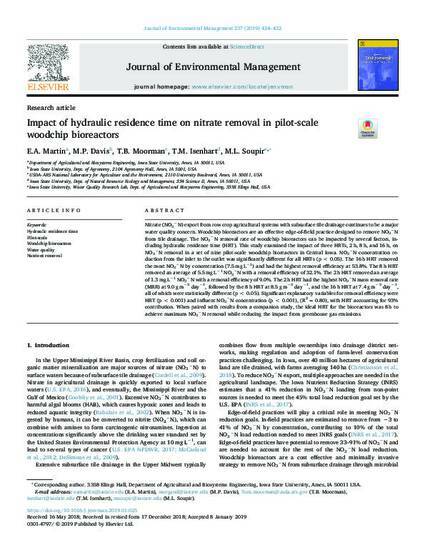 "Impact of hydraulic residence time on nitrate removal in pilot-scale woodchip bioreactors." Journal of Environmental Management 237 (2019): 424-432. DOI: 10.1016/j.jenvman.2019.01.025.